Fisheries observer Keith Davis on board a transshipment vessel in 2012. Video courtesy Hiep Tran. With crab season under way in the Bering Sea, some 70 crab boats are bobbing around Alaska's Bristol Bay and the Aleutian Islands. About a dozen of those boats have a fisheries observer on board. The observers keep tabs on what the boats haul up from the deep. Keith Davis was supposed to be one of those observers, but he went missing in September while working on a boat off the coast of South America. KUCB's John Ryan reports. Davis has been a fisheries observer for more than 15 years. His employer says he was planning to return to Dutch Harbor this winter to do more observing work. But Davis vanished while working on a transshipment vessel about 500 miles off the coast of Peru. He disappeared one afternoon while a boat was offloading tuna to the Taiwanese ship that he was working on. The ship sailed under the flag of Panama. The Panamanian government, the U.S. Coast Guard and the FBI are investigating his disappearance. Davis's friends suspect foul play. Goodman: "Absolutely do. For a number of reasons." Lynn Goodman is a fisheries observer and a friend of Keith Davis. Goodman: "I met Keith in our Dutch Harbor bunkhouse while we were both observing on crab boats." She says Davis was exceptionally safety conscious and there's no way he would have been on board a ship without a life jacket, let alone just fall off unnoticed. Fisheries observers are a tight-knit community. They're sort of gypsy biologists. They often pursue their work all over the world, wherever governments need somebody to make sure fishing boats aren't hauling up too many of the wrong things. Davis worked several seasons out of Unalaska's Dutch Harbor. 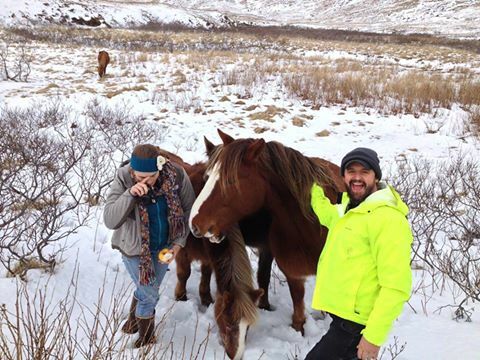 Keith Davis and a friend with Unalaska Island's wild horses in 2013. Courtesy Lynn Goodman. Goodman: "He really loved it there." Goodman: "Alaska's about the best assignment in terms of safety that we get." Observers spend days or weeks at sea, often alongside crew members who may not welcome the inconvenience or intrusion of somebody collecting data on their work. America's top fisheries official this month said she understood that tensions were on the rise between observers and the fishermen they observe. NOAA Fisheries head Eileen Sobeck said threats to observers will not be tolerated. Keith Davis was part of a group trying to establish an international bill of rights for observers to improve their safety on the job. When he was between boat trips out of Dutch Harbor, Davis would play his ukelele at the open mic night at the Grand Aleutian Hotel. He also took his ukelele out to sea with him. This is from a video that Davis shot of himself in 2012. He's in shorts, alone on the deck of a big transshipment boat, somewhere warm. Davis: "This song, I originally wrote it out at sea here, on a transshipment vessel." He tells the camera he wrote the song in honor of several observers who died at sea. Allowing us all to be free"
I asked Lynn Goodman if Davis's friends still have hope that he's alive somehow. Goodman: "I think it's highly unlikely he's still out there somewhere. If he were, we'd have heard from him by now. I have to say this, though. If anybody could still be alive, it would be Keith. He's very, very, very resourceful." Davis[sings]: "Some say he's lost. Maybe he's found." Now his family and friends are in a kind of limbo. They can't be sure whether to keep up hope that he's alive. Or else to accept that the song he wrote for other observers now applies to him as well. In Unalaska, I'm John Ryan.